Nestled within a valley of the Eastern Sierra, DK Woodworks has emerged over the years as a regional leader in fine woodworking. inspired by the dedication of our founder David Kuznitz, who began here in a humble garage over twenty-five years ago, we remain a team built upon his vision and values. Beginning by crafting custom cabinetry for the local ski resort community we have progressed to designing and creating handcrafted interiors. Always intimately tied to the inherent beauty of the sierra Nevada, we are excited for the opportunity to grow further, as our area is one of rising potential. The life-giving relationships formed from each commission received will always be at the core of our identity. We strive towards perfection in all of our responsibilities. The stewardship of positive relationships and culminating community is a responsibility that we are proud to claim, and we pursue this community from the first sketch to the final nail and beyond. Building well is a continual process of innovation. With a right attitude nothing is ever quite complete, quite good enough, quite the way you would really like it. This can be frustrating at times but can also be the catalyst for the continual pursuit of better techinques or machinery. It's really the challenge of it all that keeps our work alive. Every job is an opportunity to refine something to the next level. If it isn't innovating a new design detail it could be in a new system reducing the labor time to keep our work affordable. The process never ends and is always evolving. I have always had a love for tools, both using them and building them. This is a picture of a wide belt sander built when I was teaching and having little money and some time. It was a challenge, pneumatic belt tensioning and belt tracking, digital readouts, converyor belt feed. 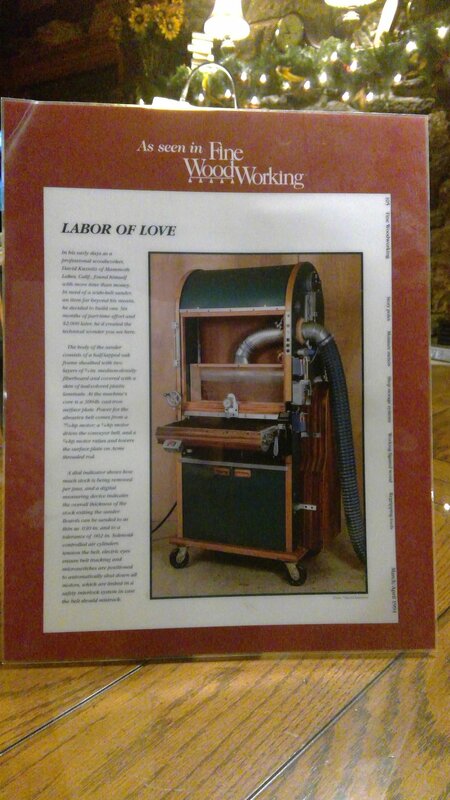 I built it with my students, and was privilidged to have it featured on the back cover of Fine Woodworking now many years ago. I have long since moved beyond using this machine but it was such a great experience developing the concepts and then using the sander. It was just one of the steps in utilizing technological advancements to better the processes. Our story continues always with many challenges. As the years pass by we are grateful for the many great opportunities we are given. I am also grateful for the people I work with who in many respects bring complimentary talents and abilities taking our work to a level far beyond what I ever could have achieved on my own. It is my hope to not only contribute to the building of great work but to do so in a manner that cares for people, both our clients and those that participate in our work. Our next chapter involves the building of a new shop. In the near future we are looking at a move. Its been many years in the planning stage and we look forward to the opportunities that will come our way through it.